The AFP Southern Minnesota chapter is one of newest and fastest growing AFP chapters in the United States. Since its inception in 2003, members from throughout Southern Minnesota have experienced great benefits from chapter meetings, peer networking, training opportunities, and National Philanthropy Day activities. Collectively, the current chapter membership brings years of experience in the fundraising field. 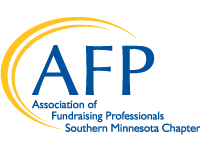 This expertise, along with resources of AFP International make membership a must for all Southern Minnesota fundraising professionals.